Lately I have received an embarrassment of riches in terms of sample bottles of absinthe. 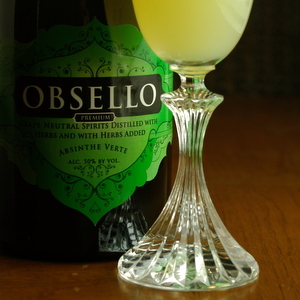 One of those I was most excited to receive was Obsello, a Spanish verte. Obsello is an absenta, which is the Spanish word for absinthe. Absentas are known to be slightly sweeter than the traditional French style. They also tend to have a distinctive citrus note to their flavor profile and are flavored with melissa (lemon balm), higher levels of star anise, and coriander. Obsello is made with grape neutral spirits produced from grapes grown in the Penedès region of Spain. Eight herbs, including grande wormwood, melissa, star anise, coriander, and mint, are added to the copper alembic stills used to make this absinthe. The final product comes in at 100 proof (50% ABV), which while stronger than most base spirits, is actually quite mild for an absinthe. Obsello is bottled in a black champagne bottle. After corking, it is dipped in black wax. And this is a pretty successful sealing mechanism. It took me quite a while to pry the wax off. The absinthe itself is a very pale green, almost more yellow than green. It is very pleasant on the nose, with slight hints of anise and mint. Straight, it has a very balanced set of flavors, with none predominating. It louches quite quickly. A 4:1 water to absinthe ratio with just a dash of simple syrup works very well, although sometimes I dispense with the sugar altogether. With water, the scent opens up. On the tongue, this is a milder absinthe. The anise flavor is there, but not highly dominant, making this an excellent introductory absinthe. The mint is also there, with the mild citrus. Wormwood plays quietly in the background. I can’t pick out the coriander. The aftertaste is surprisingly mild, althought the tongue does get that pleasant absinthe numbness. Build in champagne glass and enjoy on a languid afternoon. I find the Death in the Afternoon an excellent, slow slipping cocktail, and the relative mildness of the Obsello works well here. Quality absinthes tend to be expensive in comparison to other liquors, but given that I rarely use more than 1 ounce at a time, that’s fine for me. The list price for Obsello is $60, and in comparison to other absinthes, I think this is a fair price. This is a well crafted product that I quite enjoy. What’s your favorite absinthe cocktail? Glad to see you liked the Obsello. I enjoy it as well. There’s a special place in my heart for quality Absentas. As for my favorite cocktail, it would most definitely be a Sazerac. While it doesn’t have a large amount of absinthe, it does lend an added layer of complexity. It’s a great drink, when made properly.